Regulation (EC) No 661/2009 repeals Council Directive 91/226/EEC of 27 March 1991 on the approximation of the laws of the Member States relating to the spray suppression systems of certain categories of motor vehicles and their trailers (3). Regulation (EC) No 661/2009 lays down fundamental provisions on requirements for the type-approval of motor vehicles with regard to their spray suppression systems and the type-approval of spray suppression systems as separate technical units. It is now necessary to set out the specific procedures, tests and requirements for such type-approval. In so doing, it is appropriate to carry over to this Regulation the requirements set out in Directive 91/226/EEC adapted where necessary to the development of scientific and technical knowledge. This Regulation applies to vehicles of categories N and O, as defined in Annex II to Directive 2007/46/EC, which are fitted with a spray suppression system, as well as to spray suppression systems intended for fitment to vehicles of categories N and O.
manufacturer’s spray suppression system type designation. 1. The manufacturer or the representative of the manufacturer shall submit to the approval authority the application for EC type-approval of a vehicle with regard to its spray suppression systems. 3. If the relevant requirements set out in Annexes III and IV to this Regulation are met, the approval authority shall grant an EC type-approval and issue a type-approval number in accordance with the numbering system set out in Annex VII to Directive 2007/46/EC. An approval authority may not assign the same number to another vehicle type. 1. The manufacturer or his representative shall submit to the approval authority the application for EC separate technical unit type-approval for a type of spray suppression system. The application shall be drawn up in accordance with the model information document set out in Part 1 of Annex II. 2. If the relevant requirements set out in Annexes III and IV to this Regulation are met, the approval authority shall grant an EC separate technical unit type-approval and issue a type-approval number in accordance with the numbering system set out in Annex VII to Directive 2007/46/EC. An approval authority may not assign the same number to another type of separate technical unit. 3. For the purposes of paragraph 2, the approval authority shall deliver an EC type-approval certificate established in accordance with the model set out in Part 2 of Annex II. National authorities shall permit the sale and entry into service of vehicles and separate technical units type-approved under Directive 91/226/EEC before 1 November 2012 and continue to grant extension of approvals to those vehicles and separate technical units under the terms of Directive 91/226/EEC. Done at Brussels, 27 January 2011. (3) OJ L 103, 23.4.1991, p. 5. (5) OJ L 129, 14.5.1992, p. 95. Information document No … relating to the EC type-approval of a vehicle with regard to its spray suppression systems (1). (1) For vehicles of category N1 and those of category N2 with a technically permissible maximum laden mass not exceeding 7,5 tonnes using the derogation of point 0.1 of Annex IV to this Regulation, the information document set out in Annex II to Directive 78/549/EEC may be used. (4) As defined in Directive 2007/46/EC, Annex II, Section A. Information document No … relating to the EC type-approval as a separate technical unit of spray suppression systems. 2. The EC separate technical unit type-approval mark shall be affixed to the spray suppression device in such a way as to be indelible as well as clearly and easily legible even if the device is fitted to a vehicle. 3. An example of an EC separate technical unit type-approval mark is shown as follows. The EC separate technical unit type-approval was issued by The Netherlands under number 0046. The first two digits ‘00’ indicate that the separate technical unit was approved according to this Regulation. The symbol ‘A’ indicates it is a device of the energy-absorption type. 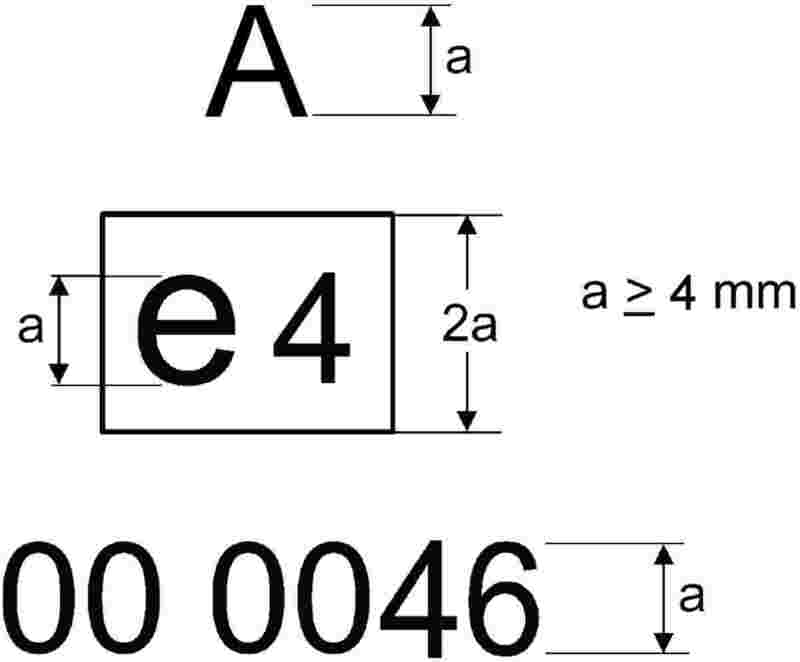 (2) If the means of identification of type contains characters not relevant to describe the vehicle, component or separate technical unit types covered by this information document, such characters shall be represented in the documentation by the symbol ‘?’ (e.g. ABC??123??). 0.1. Spray-suppression devices must be constructed in such a way that they operate properly when used normally on wet roads. Moreover, they must incorporate no structural or manufacturing defect detrimental to their proper functioning or behaviour. 1.1. Depending on their physical operating principle spray-suppression devices are subjected to the relevant tests as described in Parts 2 and 3 and must deliver the results required in point 5 of those Parts. 2.1. The application for EC component type-approval pursuant to Article 7 of Directive 2007/46/EC of a type of spray-suppression device shall be submitted by the manufacturer. 2.2. A model for the information document is set out in Part 1 of Annex II. Four samples: three of which are for tests and a fourth is to be kept by the laboratory for any subsequent verification. The test laboratory may require further samples. 2.4.1. Each sample must be clearly and indelibly marked with the trade name or mark and an indication of the type and include a space that is large enough for the EC component type-approval mark. 2.4.2. A symbol ‘A’ for devices of the energy-absorption type or ‘S’ for devices of the air/water separator type shall be added to the approval mark in accordance with point 1.3 of the Appendix of Annex VII to Directive 2007/46/EC. The aim of this test is to quantify the ability of a device to retain the water directed against it by a series of jets. The test assembly is intended to reproduce the conditions under which the device is to function when fitted to a vehicle as regards the volume and speed of the water thrown up from the ground by the tyre tread. See Figure 8 in Annex VI for a description of the test assembly. 3.1. The tests must be carried out in a closed room with a still-air environment. 3.2. The ambient temperature and the temperature of the test pieces must be 21 (± 3) °C. 3.3. De-ionised water is to be used. 3.4. The test pieces must be prepared for each test by wetting. 4.1. Secure a 500 (+ 0/– 5) mm wide 750 mm high sample of the equipment to be tested to the vertical plate of the testing equipment, making sure that the sample lies well within the limits of the collector, and that no obstacle is able to deflect the water, either before or after its impact. 4.2. 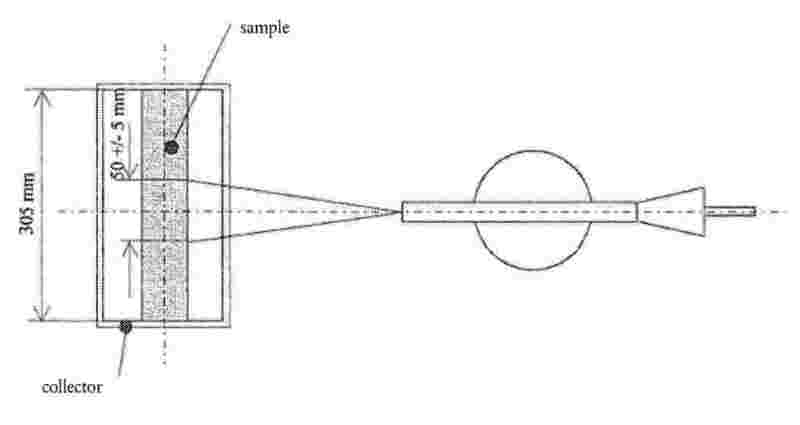 Set the water flow rate at 0,675 (+/– 0,01) l/s and direct at least 90 l, at most 120 l on to the sample from a horizontal distance of 500 (+/– 2) mm (Figure 8 of Annex VI). 4.3. Allow the water to trickle from the sample into the collector. 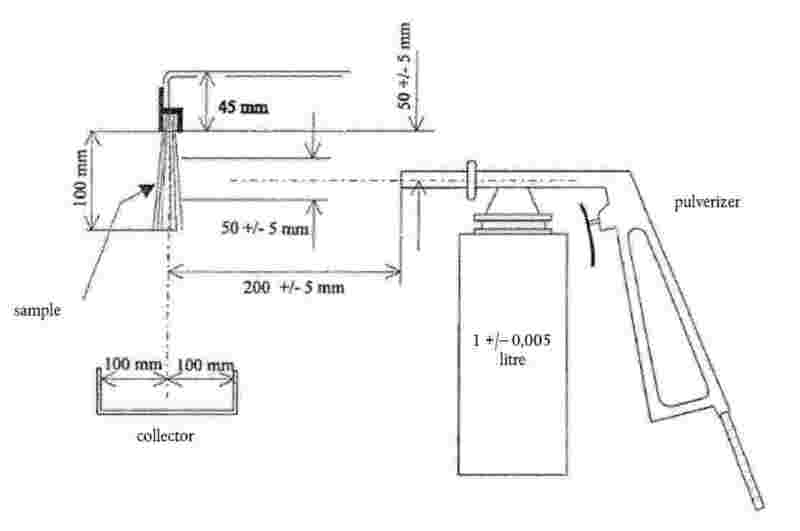 Calculate the percentage of water collected versus the quantity of water sprayed. 4.4. Carry out the test five times on the sample according to points 4.2 and 4.3. Calculate the average percentage of the series of five tests. 5.1. The average percentage calculated in point 4.4 must be 70 % or higher. 5.2. If within a series of five tests the highest and lowest percentages of water collected depart from the average percentage by more than 5 %, the series of five tests must be repeated. If within a second series of five tests the highest and lowest percentages of water recovered again depart from the average percentage by more than 5 % and if the lower value does not satisfy the requirements of point 5.1, type-approval shall be refused. 5.3. Test whether the vertical position of the device influences the results obtained. If it is the case, the procedure described in points 4.1 to 4.4 must be repeated in the positions giving the highest and lowest percentage of water collected; the requirements of point 5.2 remain in force. The mean of the individual results shall then be taken to give the average percentage. This average percentage must be 70 or higher. This test is intended to determine the effectiveness of a porous material intended to retain the water with which it has been sprayed by means of a pressurised air/water pulveriser. The equipment used for the test must simulate the conditions to which the material would be submitted, with regard to the volume and speed of the water sprays produced by the tyres, if it were fitted to a vehicle. See Figure 9 in Annex VI for a description of the test assembly. 3.3. De-ionised water must be used. 4.1. Secure a 305 × 100 mm sample vertically in the test assembly, check that there is no space between the sample and the upper curved plate and that the tray is properly in position. Fill the pulveriser tank with 1 ± 0,005 litres of water and place this as described in the diagram. pulverisation: circular, 50 ± 5 mm in diameter at 200 ± 5 mm from the sample, nozzle 5 ± 0,1 mm in diameter. 4.3. Pulverise until there is no more water mist and note the time taken. Let the water flow out of the sample on to the tray for 60 seconds and measure the volume of water collected. Measure the quantity of water left in the pulveriser tank. Calculate the percentage by volume of water collected versus the volume of water pulverised. 4.4. Carry out the test five times and calculate the average percentage of the quantity collected. Check before each test that the tray, pulveriser tank and measuring vessel are dry. 5.1. The average percentage calculated in point 4.4 must be 85 % or higher. 5.2. If within a series of five tests the highest and lowest percentages of water collected depart from the average percentage by more than 5 %, the series of five tests must be repeated. If within a second series of five tests the highest and lowest percentages of water recovered again depart from the average percentage by more than 5 %, and if the lower value does not satisfy the requirements of point 5.1, type-approval shall be refused. 5.3. Where the vertical position of the device influences the results obtained, the procedure described in points 4.1 to 4.4 must be repeated in the positions giving the highest and lowest percentages of water collected; the requirements of point 5.2 remain in force. The requirement of point 5.1 remains in force in order to give the results of each test. 0.1. Category N and O vehicles, with the exception of off-road vehicles as defined in Annex II to Directive 2007/46/EC, shall be constructed and/or fitted with spray suppression systems in such a way as to meet the requirements laid down in this Annex. In the case of chassis/cab vehicles, these requirements may only be applied to the wheels covered by the cab. For vehicles of category N1 and N2 with a permissible maximum laden mass not exceeding 7,5 tonnes, the requirements of Council Directive 78/549/EEC (1) may be applied as alternative to the requirements of this Regulation at the request of the manufacturer. 0.2. The requirements of this Annex relating to spray-suppression devices, as defined in Article 2(4), are not mandatory for categories N, O1 and O2 vehicles with a permissible maximum laden mass not exceeding 7,5 tonnes, chassis/cab vehicles, unbodied vehicles or vehicles on which the presence of spray-suppression devices would be incompatible with their use. However, if such devices are fitted to those vehicles, they must conform to the requirements of this Regulation. 1. A vehicle representative of the vehicle type to be approved, fitted with its spray-suppression system, must be submitted to the technical service conducting the approval tests. Where a vehicle is fitted with one or more retractable axles, the spray-suppression system must cover all the wheels when the axle is lowered and the wheels in contact with the ground when the axle is raised. For the purpose of this Regulation, a self-tracking axle of the ‘pivot steering’ type is considered to be, and treated as, an axle fitted with steered wheels. Where a vehicle is fitted with a self-tracking axle, the spray-suppression system must satisfy the conditions applicable to non-steered wheels if mounted on the pivoting part. If not mounted on that part it must satisfy the conditions that are applicable to steered wheels. The distance ‘c’ between the longitudinal plane tangential to the outer tyre wall, apart from any tyre bulge near the ground, and the inner edge of the valance must not exceed 100 mm (Figures 1a and 1b of Annex VI). the tyres must be inflated to their normal pressure. 5.1. The spray-suppression system must meet the specifications set out in point 6 or 8. 5.2. The spray-suppression system for non-steered or self-steered wheels that are covered by the bodywork floor, or by the lower part of the load platform, must meet either the specifications set out in point 6 or 8 or else those in point 7. 6. Requirements concerning energy-absorption spray suppression systems for axles fitted with steered or self-steering or non-steered wheels. in the case of a single or multiple axle, the forward edge (C) must extend forwards to reach a line O-Z where Θ (theta) is no more than 45° above the horizontal. the mudguard must possess a total width ‘q’ (Figure 1a of Annex VI) at least adequate to cover the width of the tyre ‘b’ or the entire width of two tyres ‘t’ in the case of twin wheels, account being taken of the extremes for the tyre/wheel unit specified by the manufacturer. Dimensions ‘b’ and ‘t’ shall be measured at hub height, excluding any markings, ribs, protective bands, etc., on the tyre walls. 6.1.2. The front side of the rear part of the mudguard must be fitted with a spray-reduction device complying with the specifications set out in Part 2 of Annex III. 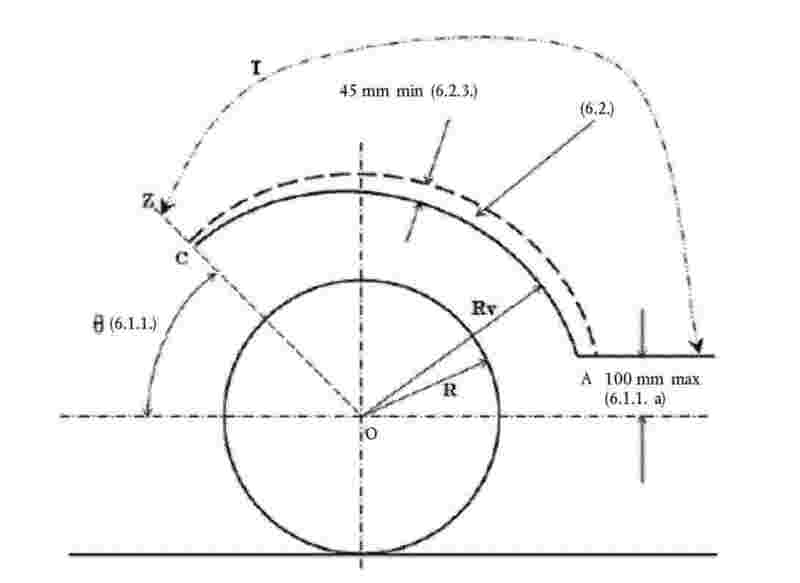 This material must cover the inside of the mudguard up to a height determined by a straight line running from the centre of the wheel and forming an angle of at least 30° with the horizontal (Figure 3 of Annex VI). 6.1.3. If the mudguards are made up of several components, when fitted, they must not incorporate any aperture enabling spray to exit while the vehicle is in motion. This requirement is deemed to be met if, when the vehicle is either laden or unladen, any radial jet running outwards from the wheel centre over the entire width of the tyre running surface and within the range covered by the mudguard always strikes against a part of the spray suppression system. 6.2.1. In the case of single axles, the lower edge of the outer valance may not be situated beyond the following distances and radii, as measured from the centre of the wheel, except at the lowest extremities that may be rounded (Figure 2 of Annex VI). where R is the radius of the tyre fitted to the vehicle, and Rv the distance, expressed as a radius, at which the lower edge of the outer valence is situated. 6.2.2. In the case of multiple axles the requirements laid down in point 6.2.1 do not apply between the vertical transversal planes passing through the centre of the first and the last axles where the outer valance may be straight in order to ensure the continuity of the spray suppression system. (Figure 4 of Annex VI). 6.2.3. The distance between the uppermost and the lowermost points of the spray suppression system (mudguard and outer valance) measured in any cross section perpendicular to the mudguard (see Figures 1b and 2 in Annex VI) must extend to not less than 45 mm at all points behind a vertical line passing through the centre of the wheel or the first wheel in the case of multiple axles. This dimension may be gradually reduced in front of this line. 6.2.4. No openings enabling spray to emerge when the vehicle is moving are allowed in the outer valances or between the outer valances and the other parts of the mudguards. 6.2.5. The requirements of points 6.2.3 and 6.2.4 may not be respected locally when the valance is composed by different elements with relative movement. 6.2.6. Tractors for semi-trailers with a low chassis, namely those which may have a height of coupling face (defined in point 6.20 of standard ISO 612 of 1978) equal to or less than 1 100 mm, may be designed in such a way as to be exempted from the requirements of points 6.1.1(a), 6.1.3 and 6.2.4. In this regard, mudguards and valances may not cover the area immediately above the tyres of the rear axles, when these tractors are coupled to a semi-trailer, in order to avoid the spray-suppression system being destroyed. However, the mudguards and valances of these vehicles must conform to the requirements of the above points, in sectors more than 60° from the vertical line passing through the centre of the wheel, in front and behind these tyres. Those vehicles must therefore be designed in such a way as to meet the requirements set out in the first paragraph when they are operated without a semi-trailer. In order to be able to meet those requirements, mudguards and valances may, for example, comprise a removable part. 6.3.1. The width of the flap must fulfil the requirement for ‘q’ in point 6.1.1(c), except for any part of the flap that is contained within the mudguards. In such cases this part of the flap must be at least equal in width to the tread of the tyre. 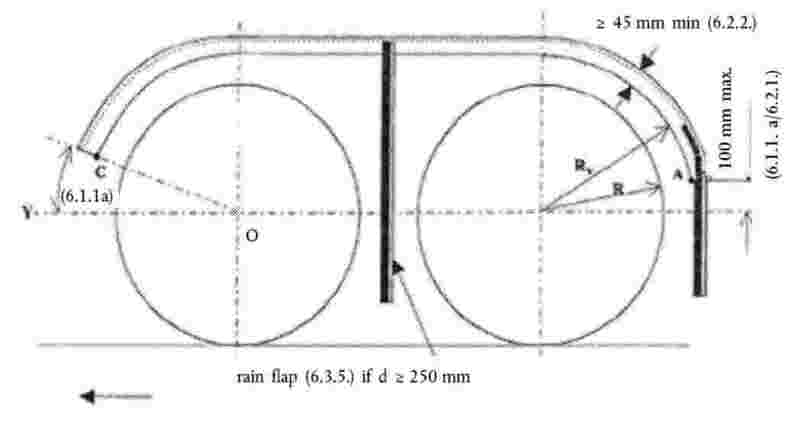 The width of the part of the rain flaps positioned beneath the mudguard must satisfy the condition laid down in this paragraph with a tolerance of ± 10 mm at each side. 6.3.2. The orientation of the flap must be basically vertical. 6.3.3. The maximum height of the bottom edge must not exceed 200 mm (Figure 3 of Annex VI). 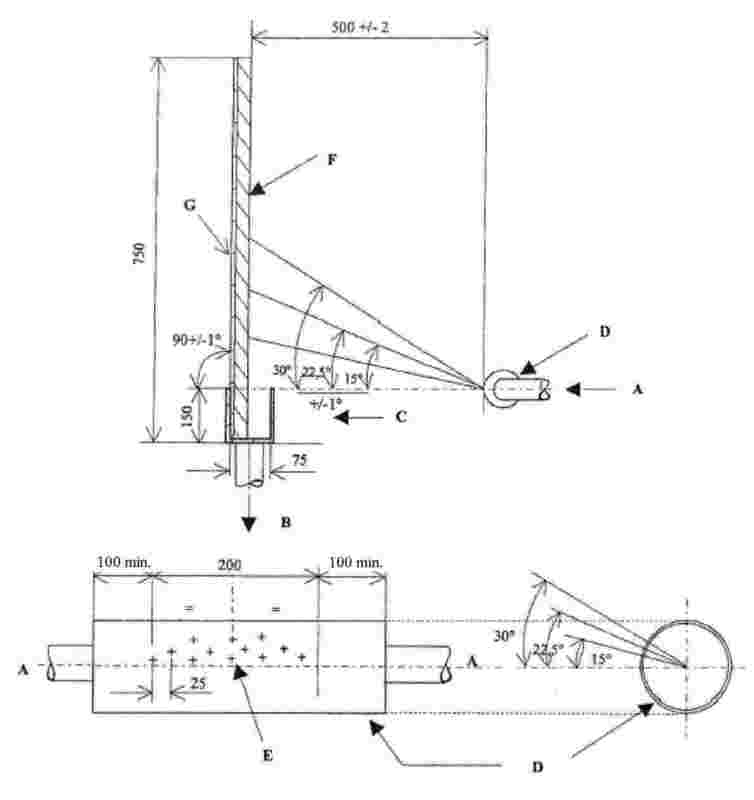 This distance is increased to 300 mm in the case of the last axle where the radial distance of the lower edge of the outer valancing, Rv, does not exceed the dimensions of the radius of the tyres fitted to the wheels on that axle. The maximum height of the bottom edge of the rain flap in relation to the ground, may be raised to 300 mm if the manufacturer deems it technically appropriate with regard to the suspension characteristics. 6.3.4. The rain flap must not be more than 300 mm from the rearmost edge of the tyre, measured horizontally. 6.3.5. In the case of multiple axles where distance d between the tyres on adjacent axles is less than 250 mm, only the rear set of wheels must be fitted with rain flaps. There must be a rain flap behind each wheel when distance d between the tyres on adjacent axles is at least 250 mm (Figure 4 of Annex VI). 6.3.6. Rain flaps must not be deflected by more than 100 mm towards the rear under a force of 3 N per 100 mm of flap width, applied to a point located 50 mm above the lower edge of the flaps. 6.3.7. 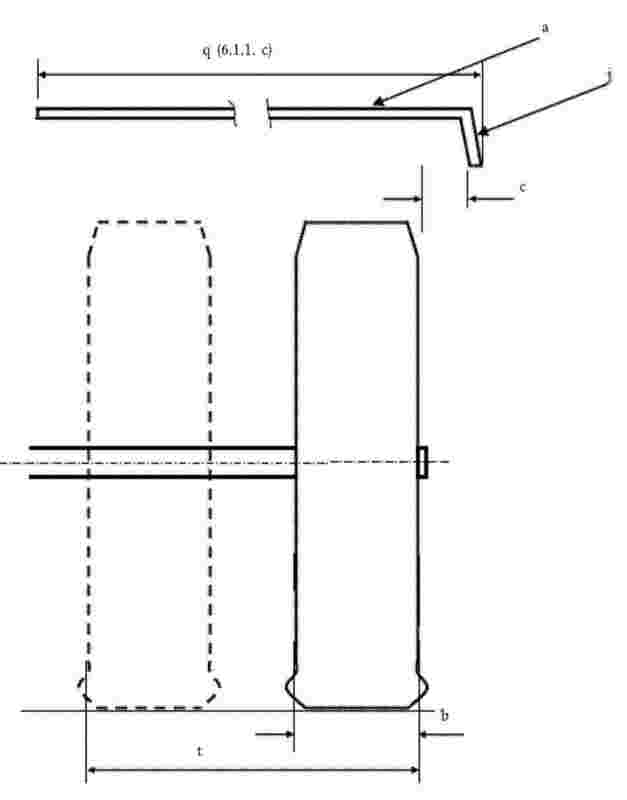 The whole of the front face of the part of the rain flap having the minimum dimensions required must be fitted with a spray-suppression device that meets the specifications set out in Part 2 of Annex III. 6.3.8. No openings enabling spray to emerge are allowed between the lower rear edge of the mudguard and the rain flaps. 6.3.9. Where the spray-suppression device meets the specifications relating to rain flaps (point 6.3), no additional rain flap is required. 7. Requirements relating to spray-suppression systems fitted with energy-absorption spray-suppression devices for certain axles that are fitted with non-steered or self-steering wheels (see point 5.2). 7.1.1. Mudguards must cover the zone immediately above the tyre or tyres. Their front and rear extremities must extend at least to the horizontal plane that is tangent to the upper edge of the tyre or tyres (Figure 5 of Annex VI). However, the rear extremity may be replaced by the rain flap, in which case this must extend to the upper part of the mudguard (or equivalent component). 7.1.2. All of the inner rear part of the mudguard must be fitted with a spray-suppression device that meets the requirements set out in Part 2 of Annex III. 7.2.1. 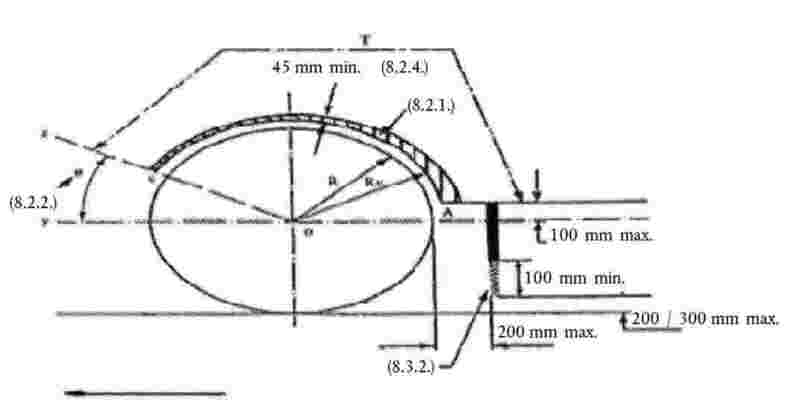 In the case of single or multiple axles where the distance between the adjacent tyres is at least 250 mm, the outer valance must cover the surface extending from the lower to the upper part of the mudguard up to a straight line formed by the tangent to the upper edge of the tyre or tyres and lying between the vertical plane formed by the tangent to the front of the tyre and the mudguard or rain flap located behind the wheel or wheels (Figure 5b of Annex VI). In the case of multiple axles an outer valance must be located by each wheel. 7.2.2. No openings enabling spray to emerge are allowed between the outer valance and the inner part of the mudguard. 7.2.3. Where rain flaps are not fitted behind each wheel (see point 6.3.5), the outer valance must be unbroken between the outer edge of the rain flap to the vertical plane that is tangent to the point furthest to the front of the tyre (Figure 5a of Annex VI) of the first axle. 7.2.4. The entire inner surface of the outer valance, the height of which must not be less than 100 mm, must be fitted with an energy-absorption spray-suppression device complying with the requirements of Part 2 of Annex III. 7.3. These flaps must extend to the lower part of the mudguard and comply with points 6.3.1 to 6.3.9. 8. Requirements concerning spray-suppression systems fitted with air/water separator spray-suppression devices for axles with steered and non-steered wheels. 8.1.1. Mudguards must comply with the requirements of point 6.1.1(c). 8.1.2. Mudguards for single or multiple axles where the distance between the tyres on adjacent axles exceeds 300 mm must also comply with point 6.1.1(a). 8.1.3. 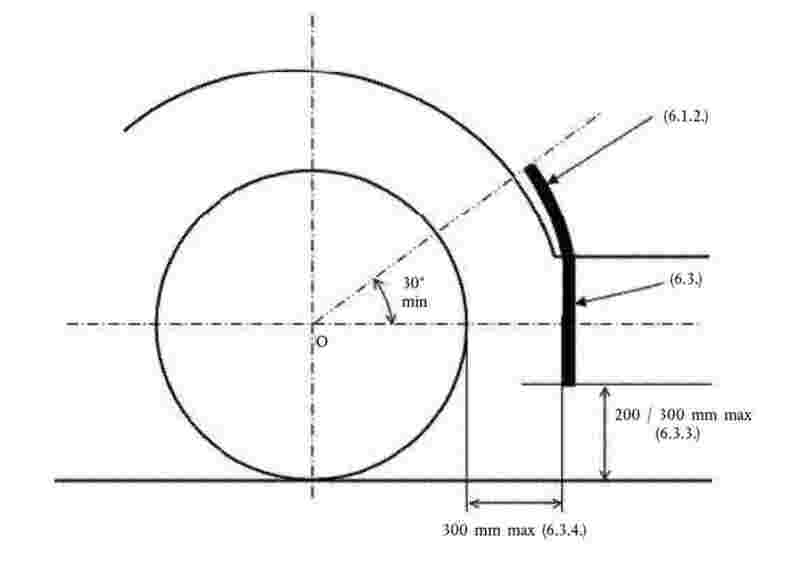 In the case, of multiple axles where the distance between the tyres on adjacent axles does not exceed 300 mm the mudguards must also conform to the model shown in Figure 7. 8.2.1. The lower edges of the outer valances must be fitted with air/water separator spray-suppression devices complying with the requirements of Part 3 of Annex III. Rv= the radial distance from the lowest edge of the outer valance to the centre of the wheel. 8.2.3. In the case of multiple axles where the distance between the tyres on adjacent axles does not exceed 300 mm, the outer valances located in the inter-axle spaces must follow the path specified in point 8.1.3, and must extend downwards in such a way as not to be more than 100 mm above a horizontal straight line passing through the wheel centres (Figure 7 of Annex VI). 8.2.4. The depth of the outer valance must extend to not less than 45 mm, at all points behind a vertical line passing through the centre of the wheel. This depth may be gradually reduced in front of this line. 8.2.5. No openings enabling spray to emerge are allowed in the outer valances or between the outer valances and the mudguards. comply with points 6.3.1, 6.3.2, 6.3.5, 6.3.8 and 8.3.2 (Figure 6 of Annex VI). 8.3.2. Spray suppression equipment complying with the specifications set out in Annex IV, must be fitted to the rain flaps referred to in point 8.3.1(b), at least along the full edge. 8.3.2.1. The lower edge of the spray-suppression device must be not more than 200 mm from the ground. 8.3.2.2. The spray-suppression device must be at least 100 mm deep. 8.3.2.3. Apart from the lower part, which includes the spray-suppression device, the rain flap as referred to in point 8.3.1(b) must not bend by more than 100 mm towards the rear under the effect of a force of 3 N per 100 mm of width of the rain flap measured at the intersection of the rain flap with the spray-suppression device in its working position, applied at a distance of 50 mm above the lower edge of the rain flap. 8.3.3. The rain flap must not be more than 200 mm from the rearmost edge of the tyre, measured horizontally. 9. In the case of multiple axles, the spray-suppression system of one axle, which is not the furthest back, may not need to cover the entire width of the tread of the tyre when there is, locally, the possibility of interference between the spray-suppression system and the structure of the axles or of the suspension or of the undercarriage. (1) OJ L 168, 26.6.1978, p. 45. Any spray-suppression device bearing the EC component type-approval mark must conform to the type that has been approved. The authority issuing the EC type-approval mark keeps one sample which, together with the EC component type-approval certificate, may be used to establish whether the devices marketed which bear the EC component type-approval mark meet the stated requirements. A type of device is defined by the model and descriptive documents lodged at the time of application for EC component type-approval. Devices whose characteristics are identical to those of the pattern device and whose other components do not differ from those of the pattern device except for variants not affecting the properties referred to in this Annex may be considered as belonging to the same type. The manufacturer carries out routine checks in order to guarantee the conformity of production of the type that has been approved. To this end the manufacturer must either have available a laboratory which is sufficiently well-equipped for the execution of the essential tests, or have the production-conformity tests carried out by an approved laboratory. The results of the production conformity checks are made available for inspection by the competent authorities for at least 1 year. The competent authorities may also conduct spot checks. Conformity of production with the type of device that has been approved must be checked under the conditions and in accordance with the methods provided for in Annex III. At the request of the authorities which have granted component type-approval, manufacturers shall provide them with devices of the type previously type-approved for the purpose of tests or conformity checks. Devices are deemed to conform if 9 out of 10 samples chosen at random satisfy the requirements of point 4 of Part 2 and point 4 of Part 3 of Annex III. If the condition specified in point 1.6 is not satisfied, a further 10 samples chosen at random must be examined. The average of all measurements taken must be in conformity with the specifications of point 4 of Part 2 and point 4 of Part 3 of Annex III, and no individual measurement must be less than 95 % of the value specified. An EC component type-approval holder ceasing production must forthwith inform the competent authorities of that fact.